Could the next world chess champion be in this bracket? 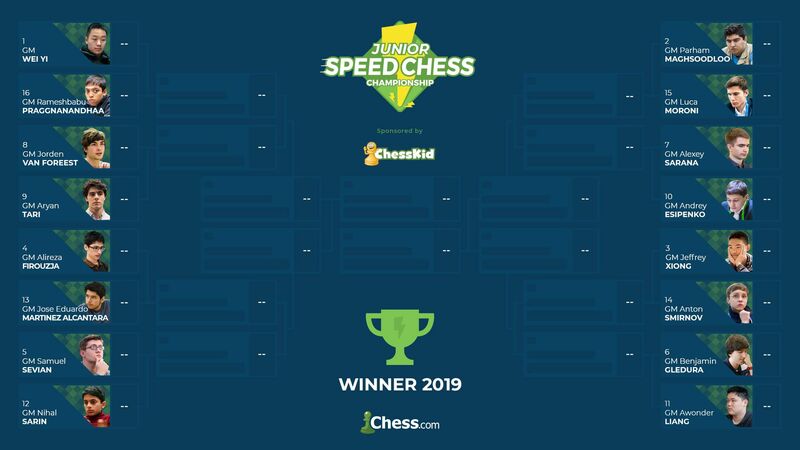 Palo Alto, Calif., April 15, 2019—Continuing the expansion of its Speed Chess Championship series, Chess.com will hold a Speed Chess Championship for talented junior players ages 21 and under. The Junior Speed Chess Championship kicks off May 16 at 10 a.m. PDT and will include 16 of the world's top young grandmasters and a prize pool of $20,000. The winner of the JSCC will also earn a place in the main Speed Chess Championship and its additional $50,000 prize pool. The tournament is presented by ChessKid.com, the world's top site for kids to learn and play chess. Each match of the Junior Speed Chess Championship will be broadcast live this spring on Chess.com/TV and Twitch.tv/chess, and will be hosted by the Chess.com commentators GM Robert Hess, IM Daniel Rensch, IM David Pruess, IM Levy Rozman. FM Mike Klein will join as a special guest representing ChessKid. Klein also announced that the winning CONIC alumnus of the inaugural ChessKid Games gets the first spot in next year's Junior Speed Chess Championship. These 16 young masters will play a series of head-to-head speed chess matches to move on in the tournament. 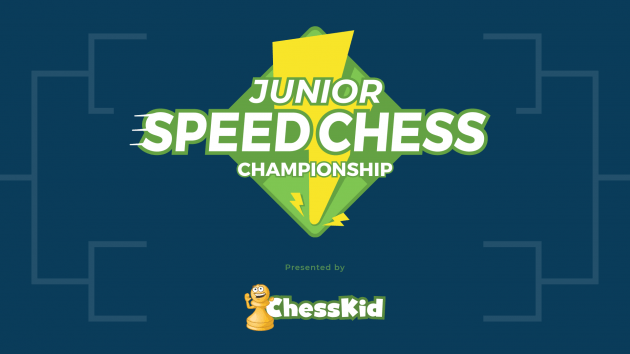 Each 2019 Junior Speed Chess Championship match will feature 90 minutes of 5/1 blitz, 60 minutes of 3/1 blitz, and 30 minutes of 1/1 bullet chess. Bracket: Click on the image for a larger version. For the full lineup of round-one matches, see the official JSCC guide. The winner of each match advances to the next line in the bracket. If match is tied after the last 1+1 bullet game, a tiebreak of 4 additional 1+1 games is played as a mini-match. If match is still tied after the mini-match tiebreaker, a single armageddon game will be played: White 5+0, Black 3+0, Black gets draw odds. The player with the highest Chess.com blitz rating at the start of the Armageddon chooses his color. Round 1: 16 players, 8 matches, $6,400 prize pool. Round 2: 8 players, 4 matches, $4,800 prize pool. For more information, including the upcoming schedule, prizes, players, graphics and match details, please visit SpeedChessChampionship.com. Watch the Junior Speed Chess Championship this spring on Chess.com/TV and Twitch.tv/chess.